This is my future sweater, arranged theatrically in bright light. In real life it's the color of the egg yolks from chickens that eat marigold seeds. These are the first set of photos where I really tried to capture the true color. Last week I decided to use my new fabric for a sweater style I hadn't sewn lately, a sweater with drop shoulders. I love the slouchy drop shouldered look for casual days. I haven't made one recently mostly because set-in sleeves are a neater look, and I've needed neat. You may have noticed on this blog that I always say to begin a project with a fabric you love. But there's more to it than that. (There always is, isn't there?) As most of us know, the fabric must be suitable for the pattern you want to sew. (That's why all the sewing patterns have their “suggested fabrics” section.) This time, I wasn't using a commercial pattern. 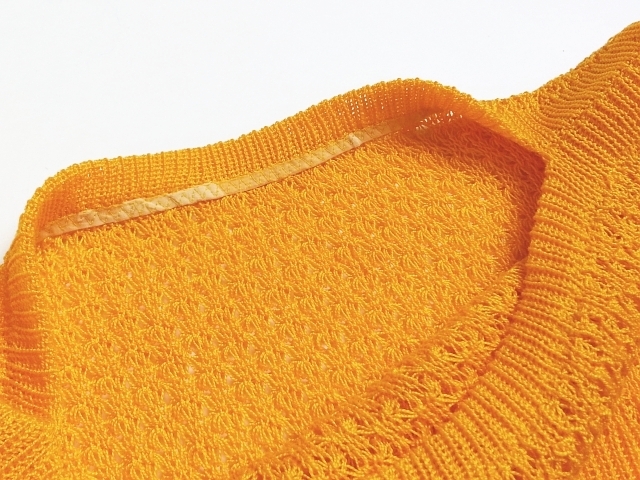 I was simply armed with the measurements for a group of rectangles that had worked perfectly as a pattern for a drop shoulder sweater in the past. I knew I was taking a chance with this somewhat clingy rib knit fabric. And when I had completed sewing the sweater and tried it on, I knew it wasn't going to work they way I wanted. Fortunately, I took precautions. That is, I didn't use my serger on this one. It'll be easy to “unsew” the sleeves. I'll then cut the armholes and sleeve heads for set in sleeves or maybe just a slight drop shoulder. The sleeve length may not be quite as I had originally planned, but I'll live with it. One thing I do love about the sweater so far is the boat neck. Not only do I like the fit and the line, but I like the way I finished the neck. I used a Hong Kong finish on the edges, modified for major stretch. (It has to go over my head.) Then I top stitched it down. Here it is pulled open for you to see. 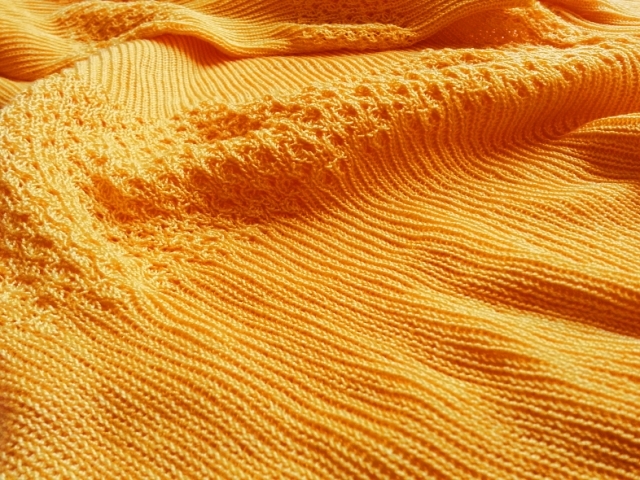 I love the color and feel of this fabric, and I can't wait until I get the chance to get back to this sweater. I hope it happens this week. The colour is glorious! It'll look amazing on you I'm sure! It's such a fun color -- bright, but not neon. Thanks! ooo, this color! i must see this on you!! !